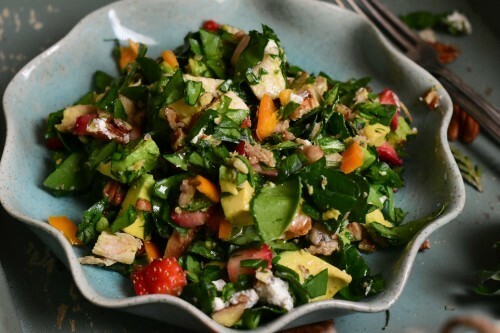 It’s been over a month since the giveaway, so I think we need to catch up before hopping into my new favorite recipe ever – this chopped chicken, strawberry & goat cheese salad! Some other news (as if moving wasn’t enough) I’m officially going part-time with my job! Cue the happy dance. That means more time to create amazing recipes like this fresh, easy, and healthy salad and share them with you! Okay – moving away from all of my news, let’s talk salad. 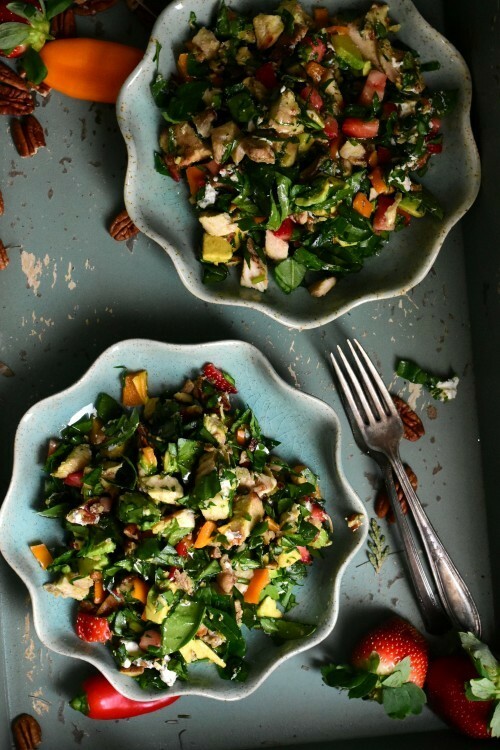 But not just any salad, let’s talk this mouthwatering rendition of my favorite kind of chopped salad! Filled with crispy Tyson® Grilled & Ready® Chicken, tart strawberries, luscious avocados, crunchy walnuts, zesty Italian dressing and herby goat cheese. Seriously guys, it’s the best salad EVER. 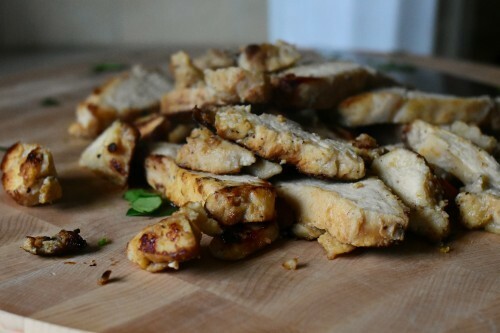 For a girl who is constantly on the go with no time to do much of anything (especially now), Tyson® Grilled & Ready® Chicken ​strips are a lifesaver. They’re amazing in pasta, salad or on their own and are so simple and convienent! When they asked me to create a recipe for them paired with my favorite Italian dressing, Wish-Bone® , I was stoked. 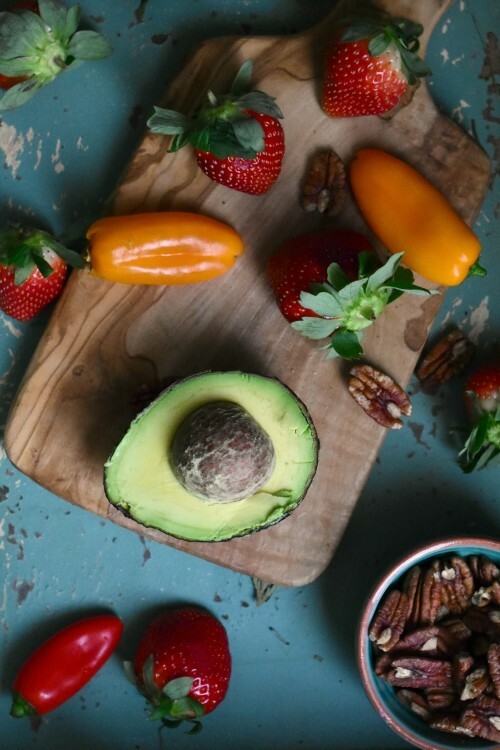 Since we’re moving back down south, I knew I had to add some fresh, summery ingredients – like strawberries and avocados. This will most definitely be my go-to salad next week. With all of our pots and pans in storage, the only thing we have left not in a box is a mixing bowl and tongs. So, clearly it’s all salad, all day long. Enough of my rambling – it’s time to share the recipe. Which is entirely why you guys are here anyway. So run to Walmart, buy Tyson® Grilled & Ready® Chicken ​ and make this freaking salad. You will thank me, trust me. 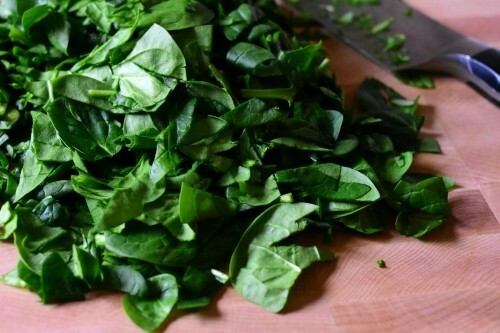 Chop the spinach finely and toss into a bowl. 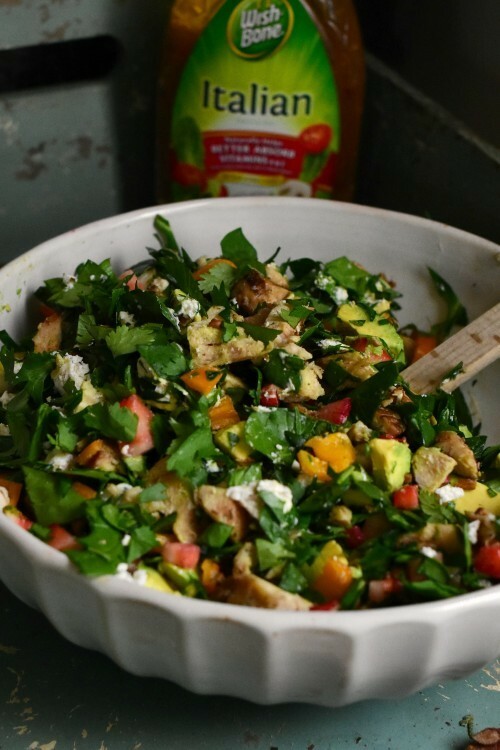 Mix in the chicken, strawberries, bell peppers, walnuts and cilantro. 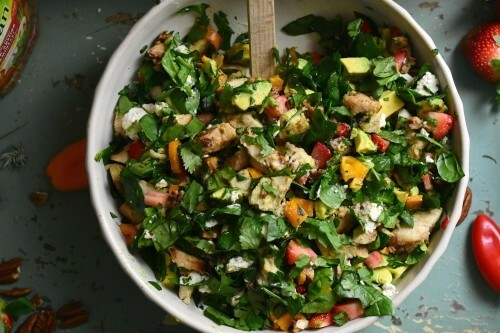 Carefully mix in the avocado and goat cheese. Lightly dress the salad and serve immediately. I would happily eat this salad for breakfast, lunch, and dinner. I love everything about it and appreciate how colorful and healthy it is! PINNING!